The Jerusalem mp3 Audio Tour is one of the best things to come out of the Jerusalem Municipality lately. The Jerusalem mp3 information is top notch. 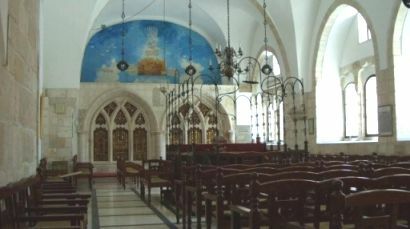 The tour information was written by Yad Ben Zvi, the premier institute for Jerusalem studies. You walk at your own pace. You can take your time taking photos of what interests you, without being rushed, or held back, by an organized group. You can hear what the tour guide is saying – and print out everything he said to take home with you. You get a Jerusalem map to follow along with. You’ll have to think ahead a little bit, though. Before you head out the door for your tour, you’ll need an internet connection and a printer if you want the map of Jerusalem. So our advice is to do this in the comfort of your own home before you leave. If you didn’t, use the internet terminal in your hotel, one of the internet cafes, or take your laptop to the center of town for free wi-fi. You need to get the audio files into your mp3. Be sure to organize them in files by tour name. Download the audio files, and print out the map for each tour. You can also download and print the text version of each tour. The downloads work best if you're using Internet Explorer. Once you've downloaded the files, be sure to come back here and read our suggestions below on how best to combine the tours. Click here to start downloading the Jerusalem mp3 Audio Tour. The tours were meant to be done individually. To combine any of the tours requires a little juggling, otherwise you’ll finish one tour on the other side of town from where the next one starts. This is especially true if you want to use the Jerusalem mp3 tour to see the Old City. Instead of one Old City tour, there are three that cover different quarters. After testing various routes, we’ve put together what we think are the best ways to combine the audio tours into a one-day tour of the Old City. The following instructions sound much more complicated than they really are. We suggest you print out the map of each tour and make a note on the map of the changes we recommend. The Tourism Information Office just inside Jaffa Gate gives out a free map of the Old City that is very helpful to bridge the gaps between the maps provided with the three tours above. Note: The morning part of this tour takes about 3 hours. The afternoon part takes about 4 hours. We like to start at Jaffa Gate because if you are staying downtown, it is the easiest gate to get to and you can pop into the Tourism Info office and pick up one of the free maps before you start. start with audio file 12 (Jaffa Gate) and work back to file 8 (the Armenian Quarter). After the Armenian Quarter, continue to Zion Gate (file 2) and continue through to file 7 (the Chamber of the Holocaust). When you finish this tour back at Zion Gate, turn right inside the gate and continue along Khabad Street to the Jewish Quarter parking lot, where you can start with file 1 of the Jewish Quarter tour. The Jewish Quarter is a good place to break for lunch. 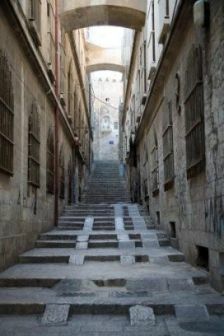 When you finish with the Ophel Archaeological Gardens (the last file of the Jewish Quarter tour), go up the steps from the plaza to the Jewish Bazaar and Tiferet Israel Street. Here you will find a variety of places to eat, from several restaurants - like the Quarter Cafe (Kosher Mehadrin) - to eateries like Coffee Bagel (Kosher Badatz Mehadrin) and even a grocery shop (near the Coffee Bagel) where you can buy a roll or stock up on water. From here, you won’t be far from audio file 23 of the Via Dolorosa tour if you want to continue exploring the Old City after lunch. Follow the Via Dolorosa tour backward from audio file 23 (the Cotton Market) to audio file 1 at Lions Gate. If you don’t want to miss Damascus Gate (audio file 23) and the Garden Tomb (audio file 25) – it’s outside the Old City and a bit of side-trip on the tour whether you’re doing it backwards or forwards – insert them between audio file 7 (the Austrian Hospice) and audio file 6 (the Ecce Homo Arch). Note: The morning part of this tour takes about 4 hours. The afternoon part takes about 3 hours. To follow the Stations of the Cross along the Via Dolorosa in the correct order, start the morning with the Via Dolorosa tour, beginning at Lions Gate (file 2). 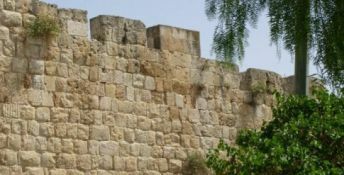 Insert Damascus Gate (audio file 24) and the Garden Tomb (audio file 25) after the Armenian Hospice. Then come back and continue with audio files 8 (the 3rd and 4th Stations of the Cross) through audio file 23 (the Cotton Market). At the end of the tour, head from the Cotton Market to the Jewish Quarter and break for lunch. After lunch, head down the steps from the Jewish Bazaar to the Ophel Archaeological Garden and follow the Jewish Quarter tour backward. When you're done, cross the Jewish Quarter parking lot to Khabad Street, follow the street to Zion Gate and begin the Zion Gate to Jaffa Gate tour in the correct order. This is a 4- to 6-hour hike best done on its own. 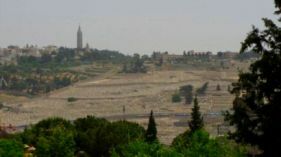 Unlike the other Jerusalem mp3 tours above, the terrain can be kind of rough and there isn’t a whole lot of shade. But if you’re up for it, the trail takes you around the outside of the Old City to some fascinating sites, back and forth through time, from the First Temple period through the present. Bring lots of water and sun hats. Return from Using the Jerusalem mp3 Audio Tour to The One-Day Tour. "As we had limited time in Jerusalem, I purchased your guide book and found it very informative. Thanks!"